It’s Monday. And it’s still pretty chilly around here. So, so hard to get out of bed. But knowing you’ve got an unfussy and meatless meal plan for tonight makes it a little bit easier. That and the fact that cleanup is a breeze. And the subtraction of any real pasta sauce. Instead you blend a little tomato paste with egg and some Parmesan cheese and toss that with the cooked pasta and veggies for a light but very satisfying carby experience that comes together with minimal effort. Also, it cuts like a dream. With a crispy, Parmesan cheese top. And I don’t know about you, but eating food that looks like a piece of pie, is just more fun somehow. All you need is a nice green salad or veggie and dinner is a go! You got this. Believe me. And it’s almost Tuesday! 1. Preheat oven to 425ºF. If you have a large cast-iron skillet, now’s the time to use it. Otherwise just use any other heavyweight ovenproof skillet or even a large casserole dish. 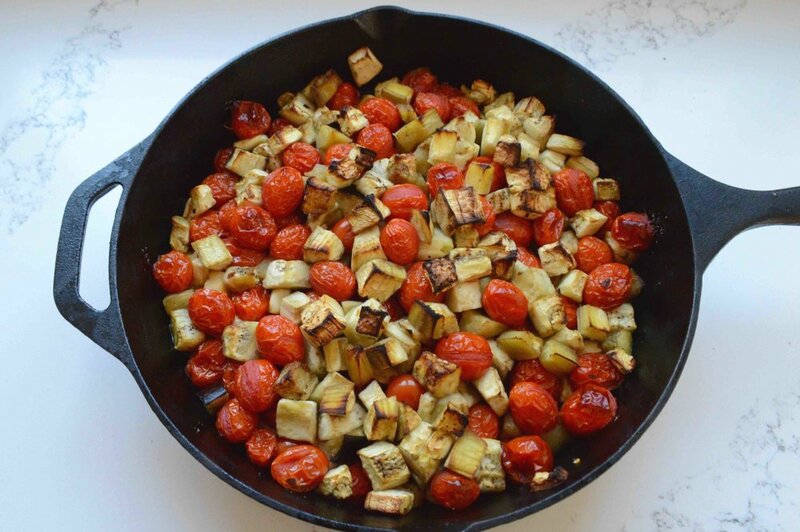 Add the eggplant, tomatoes, garlic, 1/4 cup of the oil and the red pepper flakes into the skillet and mix together. Add a pinch or two of salt and toss again. Roast, shaking the skillet a few times throughout the baking process for about 30 minutes, until the eggplant is tender and the tomatoes are starting to burst open. Careful when you remove the skillet from the oven, as the handle will be very hot! Lower the oven to 400ºF. 2. Meanwhile, bring a large salted pot of water to boil and cook the pasta until it is al dente, according to the directions on the box. Drain well and return to the pot. 3. Place the eggs and tomato paste in a small bowl and whisk together well, then add in 1 cup of the Parmesan and whisk again until smooth. Set aside. 4. When the veggies are ready, add them to the pot. Carefully wipe out the skillet with paper towels and pour in just enough oil to thinly coat the bottom of the pan. Add the egg mixture to the pot and use tongs to toss well until everything is mixed together fully. Pour the mixture into the skillet and press into an even layer. Sprinkle on the remaining 3/4 cup Parmesan and bake for about 35-40 minutes, until the top is golden brown and the tomatoes are bubbling. 5. Carefully remove from the oven again—the handle will be hot and let cool for about 10 minutes so that everything can set up and you get nice neat slices. Cut into wedges and serve. This is great reheated, or even cold. Store leftovers in an airtight container in the fridge for several days and reheat in the microwave or a low oven. Note: Recipe adapted from Bon Appetit Magazine. I tinkered quite a bit and simplified—cut out the capers and basil (although this would be good with basil—I just didn’t have any). Also, I used fettuccine instead of spaghetti. Any kind of pasta would work well. And I increased the Parm by a couple of handfuls.